Fundamentally, the market is waiting for the EU leaders (and even the global leaders) to get off their asses and properly address Europe's debt and banks, as highlighted in the post 'listen to the thunder'. Credit crunches should be few and far between, if ever, and since I have no data from the 1920s, I took a closer look at psychology of the 2008-9 crunch. The freeze kicked in when Lehman defaulted in September. At the time, the SP500 started its collapse, but the 10yr treasury had a delayed reaction. Yields did not start collapsing until mid November. They bottomed near 2%, as safe haven was sought. 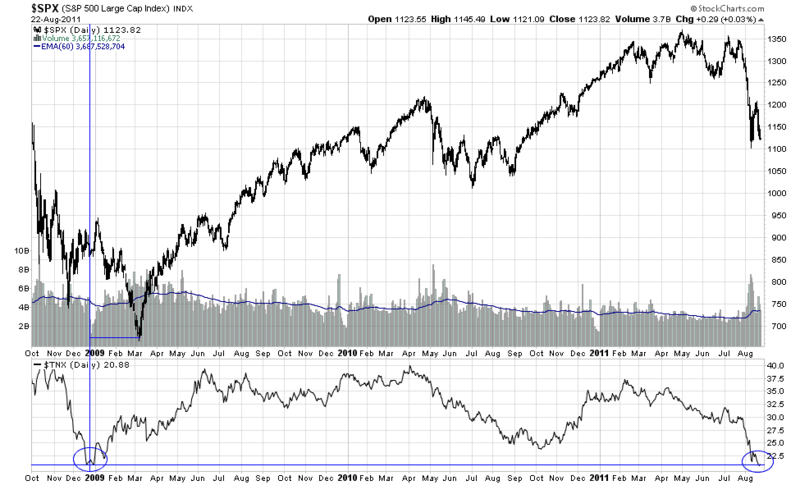 The bounce off 2% in 2009 was fairly quick, however the SP500 lagged its bottoming process. 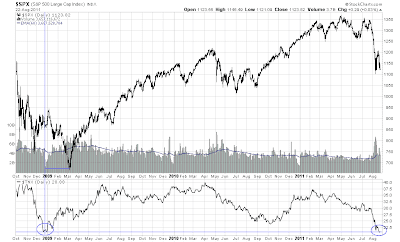 The SP500 did not bottom until 2-3months after the treasury hit bottom. The current EU fear has once again driven 10yr treasury yields to the 2008-9 levels. However, we are left to wonder, how long will the SP500 bottom out after the treasuries bottom? That is a loaded question because it assumes the 2% yield on the treasuries will be the low, and the differences between then and now must be normalized. In 2008-9 few knew of the real credit disruption that would happen with a Lehman type bank failure hence the delay into treasuries. (Even Chairman Bernanke delayed on lowering rates.) But traders were entering the dollar once Lehman went under and was seen as the safe haven first. Once treasuries started to rally, this eased the upward pressure (some what) on the dollar as a safe haven. In today's threat, by no means are we seeing upward pressure on the dollar. Instead, the pressure is spread to the Swiss Franc, Yen and (most obviously) Gold. Same effect, just different currencies. The stark difference between 2008-9 versus today, we have been seeing moves into currencies, treasuries and decline in equity markets before the freeze. The safe haven markets are preempting the potential credit freeze. (In 2008-9 the moves to the havens and severe declines in markets took place after the freeze.) And if the moves are anticipating a freeze, its likely the 10yr treasury yield has bottomed and we are closer to a market bottom than the mode would suggest. So we are left to wonder, with 2008-9 credit freeze etched into investors memory, as told from the eyes of the safe havens, have the markets already anticipated the worst? If the EU and global leaders actually show leadership, and get in front of this thing, then I say yes. However, if we get another credit freeze, all bets are obviously off. If the EU allows a credit freeze to happen, it will destroy the European Euro experiment. There will be no recovery for the Euro. It will cost too much to fix, and no country in the EU (not even Germany) will be able to pay for it. Who knows, maybe the powers-that-be want this to happen, for whatever reason that will become obvious many years from now. All I know is big-boy money is already anticipating nasty stuff.